The definitive hardware for controlling Remix Decks and integrating with TRAKTOR PRO 2. Native Instruments is one of the industry leaders in digital DJ technology, and it continues on the tradition with the TRAKTOR KONTROL F1, the definitive hardware for controlling TRAKTOR's powerful Remix Decks, with 16 stylish, multi-colored pads to fire loops and one-shot samples. Designed to work seamlessly with the flagship TRAKTOR PRO 2 software, you can get your hands on every aspect of the one of the top-selling digital DJing software platforms available. TRAKTOR KONTROL F1 can easily be integrated into any TRAKTOR-based DJ setup, designed to work seamlessly with the TRAKTOR KONTROL X1 controller and the S2 and S4 all-in-one systems, as well as DJs using timecode control, the F1 will ideally complement any DJ setup. TRAKTOR KONTROL F1 is the definitive hardware for controlling the powerful Remix Decks in TRAKTOR PRO 2, the flagship DJ software (not included.) Finally, you can launch clips in a perfectly intuitive, DJ-centric way - control Remix Decks just like regular track decks, switching between up to 64 tracks, loops and one-shot samples on each deck. With your signature sound at your fingertips, it's time to blur the line between DJing and live performance. Get started in seconds - the KONTROL F1 includes around 2 GB of premium grade sound, pre-loaded as Remix Sets. Or you can import your own samples, and even capture loops and sounds live, using the controller's stylish multi-color pads and ergonomic faders. Expand the creative potential of any TRAKTOR set-up - with or without timecode vinyl - and transform your DJ set into a dynamic live performance. The TRAKTOR KONTROL F1 workflow is rooted in DJ culture. Remix Sets, made up of your individual loops and sounds, and load them just like regular tracks in the super-powerful TRAKTOR PRO 2 software. Your drum loops, bass lines, percussion, vocals and lead sounds are ready for dropping into your performance wherever and whenever your heart desires. Four volume faders and four dedicated filter knobs provide full sonic access to the Remix Deck slots, and to add more flavor, you can route individual slots through TRAKTOR's FX units. Scratch your live production via Native Scratch timecode control and then mix and fade into a ˜traditional' track on another deck - fuse classic DJ workflow with the future of DJing. Get started in seconds - just load up the included sound collection and dive into a new level of interaction with your music. The hardware and TRAKTOR PRO 2 software respond as one. Ultra-tight integration is complemented by advanced visual feedback - assign a sample a particular color on the hardware, and see the software instantly follow suit. TRAKTOR KONTROL F1's slim profile fits anywhere. Slot it between your mixer and decks or expand your controller set-up with multiple F1s - its intuitive feel and striking visual presence is matched only by its addictively fun playability. The pads in the bottom third of the controller will trigger 16 loops or samples of your choice. You can load up to 64 audio clips into a Remix Deck - use the rotary encoder to page between groups of 16. Communication with the software works seamlessly both ways - change the color of a pad via the hardware and the software will follow suit instantly and vice versa - so you can always see exactly what's going on. Inside the TRAKTOR KONTROL F1 box you will find a Track Deck Overlay. This allows you to access hot-cues, loops, beat jumps and FX which aren't available on your turntable. 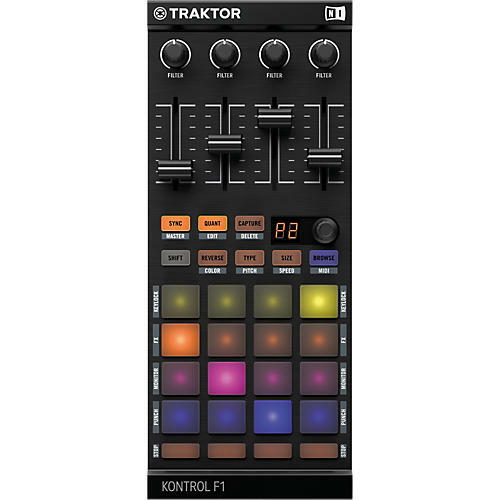 While the TRAKTOR KONTROL X1 controller was designed for most of those tasks in mind, scratch users in particular might find the pad + fader layout of the TRAKTOR KONTROL F1 more appealing. While the F1 is the ultimate Remix Deck controller, it can also be a perfect addition to any turntablist setup even if Remix Decks are not your main focus. The overlay fits neatly on the F1 hardware and allows you access all eight hot-cues, and provides control over dry/wet and the central FX parameter (FX unit in Chained Mode). Other use cases are Loop and Move mode, all with full color feedback. You can even utilize all additional deck controls like Sync, Master and Keylock with just a push of a button. Order now for the ultimate creative control over your music and DJ sets.